With the LG Isai FL now official, having been introduced Thursday by KDDI, many have taken a long look at the handset, thinking that it might give away clues about the upcoming LG G3. The Isai FL is a sequel to last year's Isai, which did share some design cues and specs with the LG G2. But on Friday morning, the Korean based manufacturer made it clear that the Isai FL is a different model altogether than its upcoming flagship. Certainly the specs of the LG Isai FL would seem to resemble some of what we expect for the LG G3. The former features a 5.5 inch screen with resolution of 1440 x 2560. A quad-core Snapdragon 801 MSM8975-AC is under the hood with 2GB of RAM inside. Back and front snappers come in at 13.2MP and 1.2MP respectively. It is all powered by a 3000mAh cell with Android 4.4.2 pre-installed. The device features WiMAX 2 + LTE-A connectivity, and includes LG's Knock Code and a new UI called Isai Motion. The phone also will survive a submersion in up to 3.2 feet of water for as long as 30 minutes. LG worked with Japanese carrier KDDI on the device, which means it probably will be exclusive to the mobile operator, like the original Isai was. Some of the specs match what we are expecting for the LG G3, such as the size and resolution of the screen. The battery size and water proofing also could match what we will see on the new flagship model. But the LG G3 should come with 3GB of RAM along with a 16MP rear-facing camera and a 2.1MP front-facing camera. In addition, there are some differences in the design of both the LG G3 and the LG Isai FL, which you can see from the pictures below, showing the rear volume controls on the Isai FL. While many have been thinking that the LG Isai FL is a Japanese version of the LG G3, apparently this is not the case. And the fact that LG is making a point of having this known, could mean that the Korean manufacturer has some very exciting specs and features to show off for the LG G3. First find out what iSAI has. I think it should be sd805 cause that's the only soc capable of handling QHD resolution. 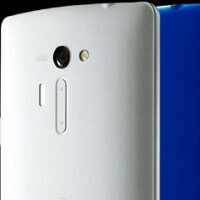 You could read the article and you would see it has a Snapdragon 801-AC. I skimmed through the article. Sorry I missed that part but the real question is how can SD801 power such a beastly display (in terms of screen res)? That is the right question. Why wouldn't 801 handle QHD? Aren't Samsung pro tablets already handling QHD ? Two year old Nexus 10 had QHD also. I dont think any game is so intense today that it would make this phone lag. Except some badly coded games. Alright I get it. I just want SD805 in G3. Am sure the G3 will be awesome and I will upgrade to it but I would like to say that the LG isai depresses me; it's drawing board UI and the "ISAI" logo on the front instead of LG looks insanely cheap. I know that LG G3 will have a much better UI but I have been seeing this LG Isai phone and it's just depressing. The LG G3 will alleviate my depression I am sure. With the announcement I have hope that the G3 will have the rumored super specs of the Snapdragon 805, micro sd and 3200maH removable battery. Hope it also still has the wireless charging I am using on my Verizon G2. Waterproofing I can take or leave. Agree with jimbo1mcm but I want the waterproof. Also hoping it's bright enough for outdoor use. The best phones are coming out of China these days. The only things LG does right with their phones is use the Sony OIS camera/sensor and include a large battery. The rest of it is generic. There are a lot of good phones coming from china but reliability and after sales . I'm not impressed. Even though one plus has a good price and specs I'm still holding on to my z1compact . I'll wait for z2c or z3 this year. LG's record on updates is not the best. I think I (and many others) will take their chances on offerings like the OnePlus One (with Cyanogen) for far less money than the LG will cost. Sony did have a good idea with the Z1 Compact. The Android market, especially in the US, would benefit from a small powerful phone like the Z2 Compact. Hopefully Sony gets its act together and starts selling phones (for real) in the US before it is too late for them. Well I think If China could improve their name, They'll dominate the Mobile market just as how ASUS and Acer dominates the Budget and Home-Built PC market. Oh yes, Also note that All of the famous android Mobile manufacturer are now 'Generic'. its getting more and more ridicules with this phone what do they thing by making a bigger its better wish some would just create one just wright size so doesn't feel like u carrying dam laptop in you hand.